With broadband connections and routers starting to become cheap, Wi-Fi routers has become a norm. There is a high chance that you have connected to the internet via internet. We all have our fair share of experience of malfunctioning lagging Wi-Fi router. Trust me, I have too. Well, your parents and siblings yelling at you about why they can’t YouTube or Facebook is so much annoying, especially when you are in the middle of a brainstorm trying to fix your code. Sometimes, I used to wonder, “Oh God, Why? Why did I even bring a router in this home? Their ‘threeG’ internet would have been enough.” Added to that, there is this Wi-Fi range issue. Go to next room, poor Wi-Fi signal. Go to washroom. Dayumn, no signal. 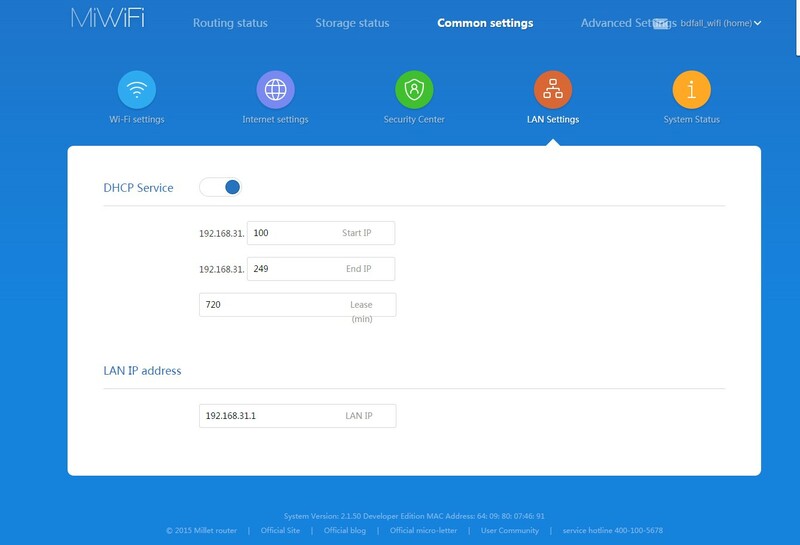 So, then one day my Xiaomi “fenboy” friend came to me and said, “I have this awesome Xiaomi router. You should try using it.” Being fed up with the TP-LINK router I use, I totally took the offer. Then the day came and he handed me this small brown cardboard box. 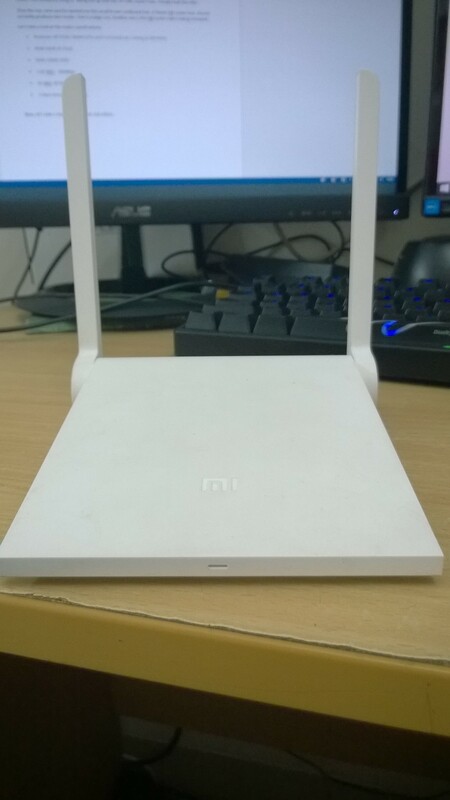 A Xiaomi Mi Router mini. Xiaomi currently produces two routers. One is a large size. Another one is this Mi router mini which is being reviewed. Costing about 3700 BDT this is the cheapest Dual Band AC router you can afford right now. It also happens to have the best Wi-Fi signal strength at this price range. Before we go deeper, let’s talk about this Wi-Fi standards and their speed. Every type of networking devices have specifications that are based on some standards. For Wi-Fi the standard is IEEE 802.11. If you happen to have a router, you will notice that there is something written like IEEE 802.11b/g/n. The b, g, n parts are the revision standards the routers supports. IEEE 802.11ac is the latest standard developed. AC standard has the maximum theoretical speed of 1.3Gbps which is about 3x faster than the previous generation N standard’s 450 Mbps. 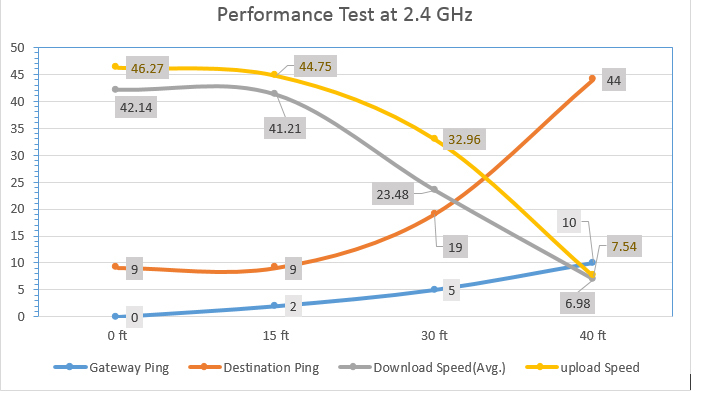 These speeds are theoretical because there is a huge difference between theoretical and practical performance when the transmission medium is wireless. 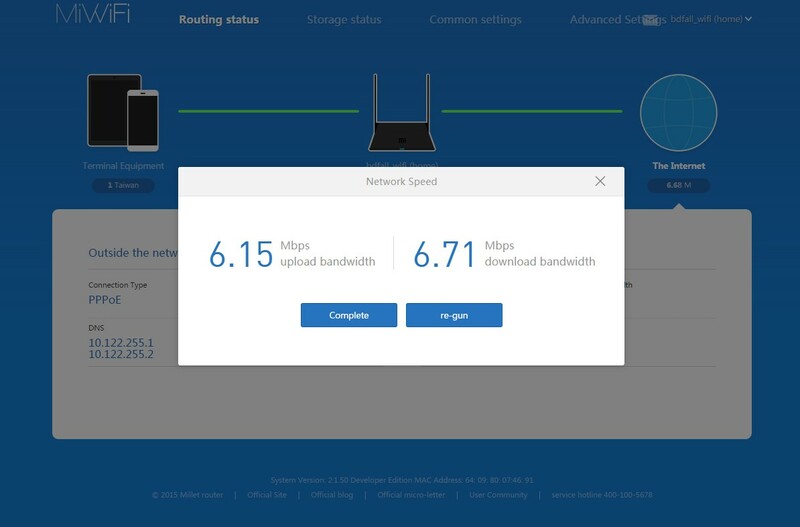 AC routers are generally faster, has better signal strength and provide more concurrent connections than N routers because of how it works. Which means watching 4K YouTube videos over Wi-Fi has become easy now. Now, let’s take a look at the outlook and others. From the specifications we can see that it is an AC1200 router. 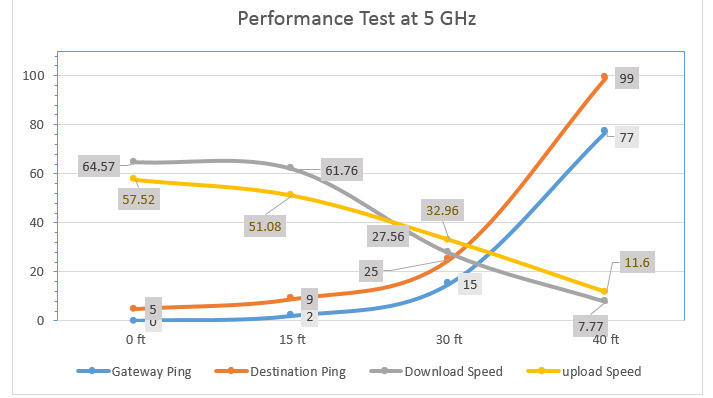 Because AC1200 has max theoretical throughput of 867 Mbps over 5GHz. 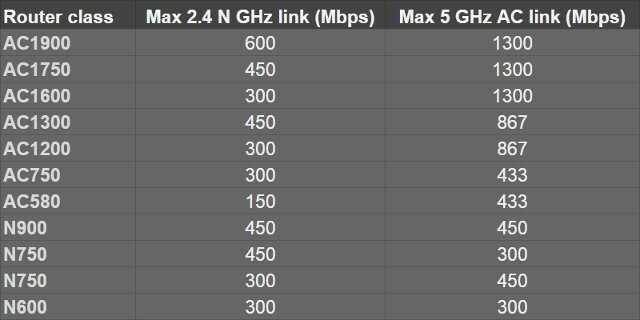 Here is a table of wireless speeds (courtesy: cnx-software). 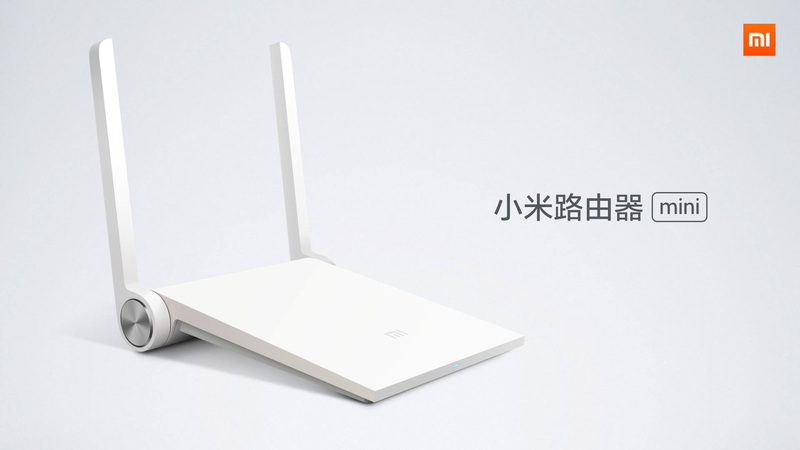 Interface: Xiaomi packs the router with their own version of Open-WRT named Mi Wi-Fi rom. This review is based on the firmware version 2.1.50. Initially it had the firmware version 0.7 on which I had wrote the original review. Sadly, the firmware has no English version. The default language is Chinese. I searched for some time for an English version but couldn’t find one. The other one however has an English language interface. 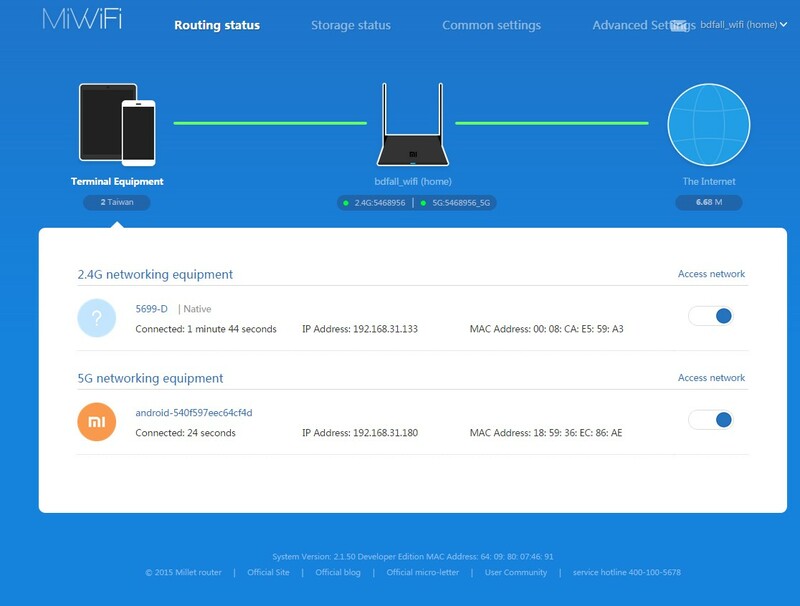 When you start and connect to the router for the first time, it will automatically take you the router control panel via default web browser. As the interface is in Chinese, I tried to find an offline translator but failed to do so. So, I carried on with the Chinese interface. The first scene as you can see is the accept terms & conditions page and I blindly pressed the only button I found. 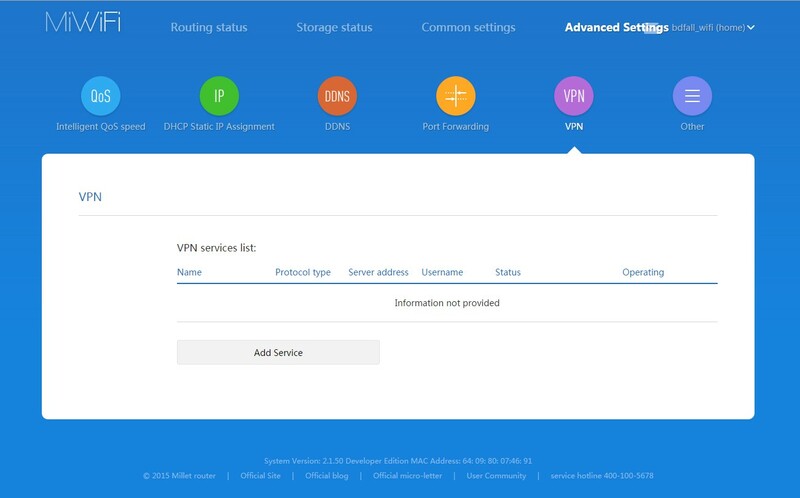 If you don’t connect any cable to the wan port, it will give you the option to use the router as a relay or repeater. On the second page, router automatically detected my connection type as PPPoE and prompted to give ID & password. I couldn’t have possibly understand about inputting ID & password without the “DHCP” below the button. Next thing the router asked for was the SSID & Wi-Fi password which I entered. 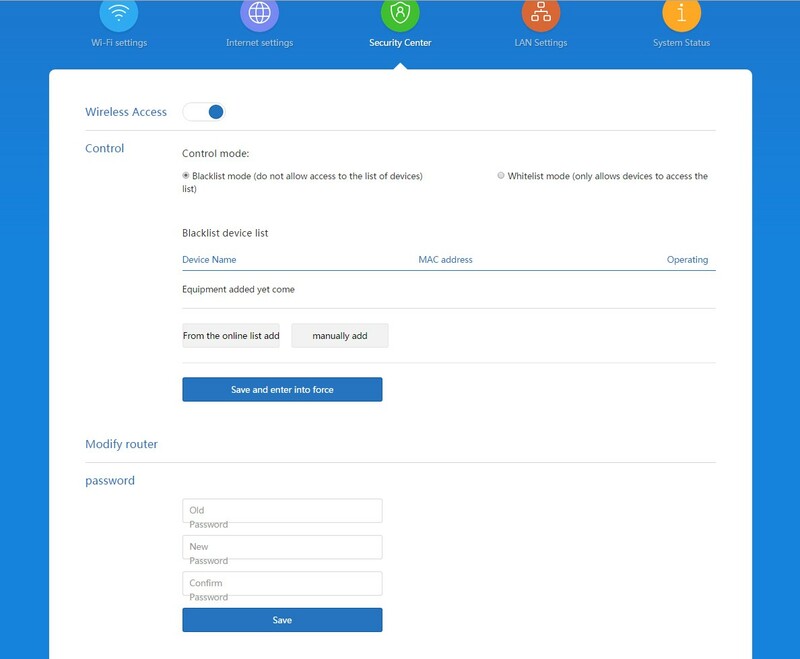 Control panel ID & password. While the router initializes the new settings it shows the SSID and some other features. This is the default page showing the router status. Here the processor speed is showing as 800 MHz. But Xiaomi mentions in their specification that it is 568 MHz. Also showing the plethora of devices connected to the network. With 7 devices connected to the router, my TP-Link would have hanged after a while. Devices tabs showing devices connected to the 2.4G and 5G network. You can easily block devices from accessing by clicking the slider. Blocking all those Wi-Fi thieves has never been so easier. 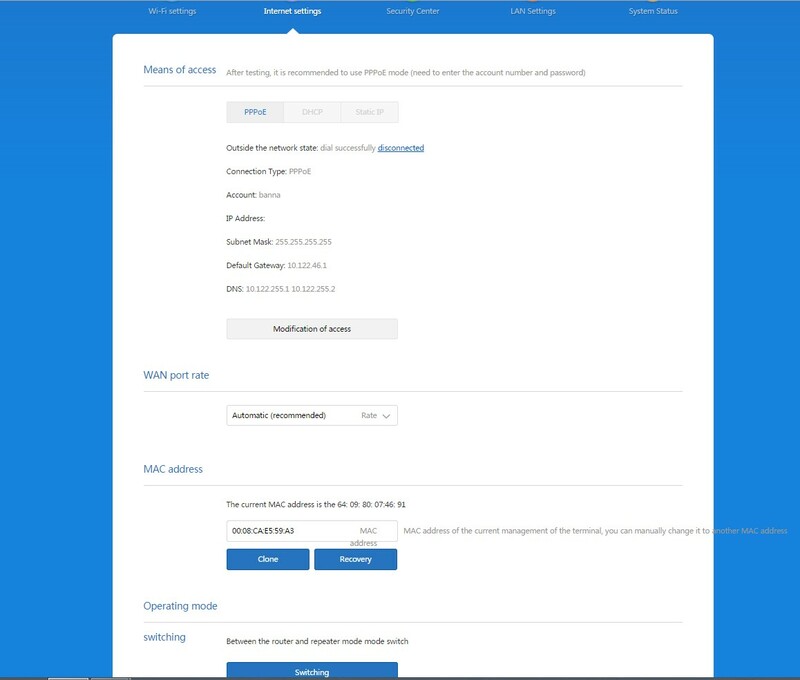 The internet tab shows your IP address, connections type, DNS and gateway of your ISP. There is speed-test software which determines your connection speed. Good way to see whether your ISP is fulfilling the promise or not. My good guy ISP is providing more speed than I bargained for. Good to know. The 2nd topmost button takes to the storage status page. The router provides an USB 2.0 port to connect USB storage devices and use it as a cloud storage. Clicking on the Common settings a.k.a third button from the top takes us Wi-Fi, internet and other settings. There are individual settings for 2.4G and 5G bands. And the form is self-explanatory. The router provides 3 levels of signal strength which roughly translates to wall, normal and energy saving. 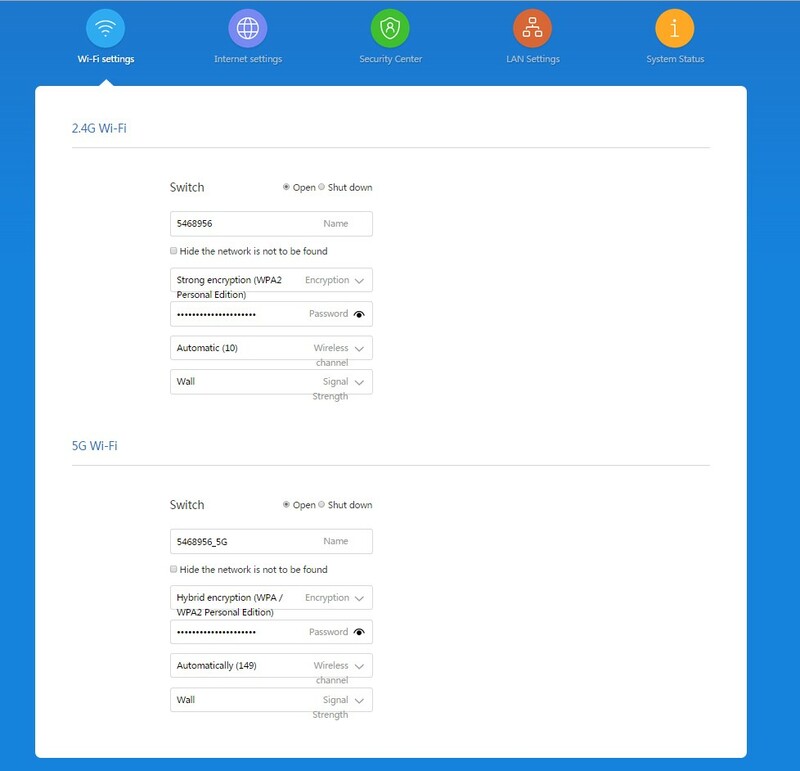 Internet tab lets you change your connection type, WAN speed, MAC address and router operating mode. You can easily switch your router to repeater on relay mode. 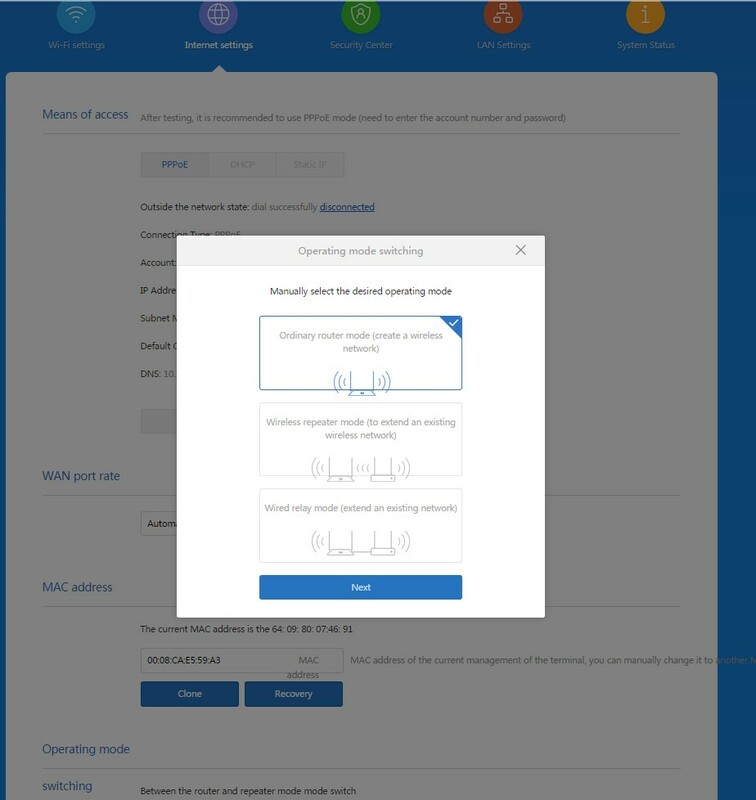 Moving over to the 4th/last topmost button takes to the bandwidth control, IP binding, port forwarding, DDNS, VPN and other settings. The default bandwidth control or QOS isn’t the best feature you will normally see. Turning on this feature capped my steam download speed to merely 120 KB/s. 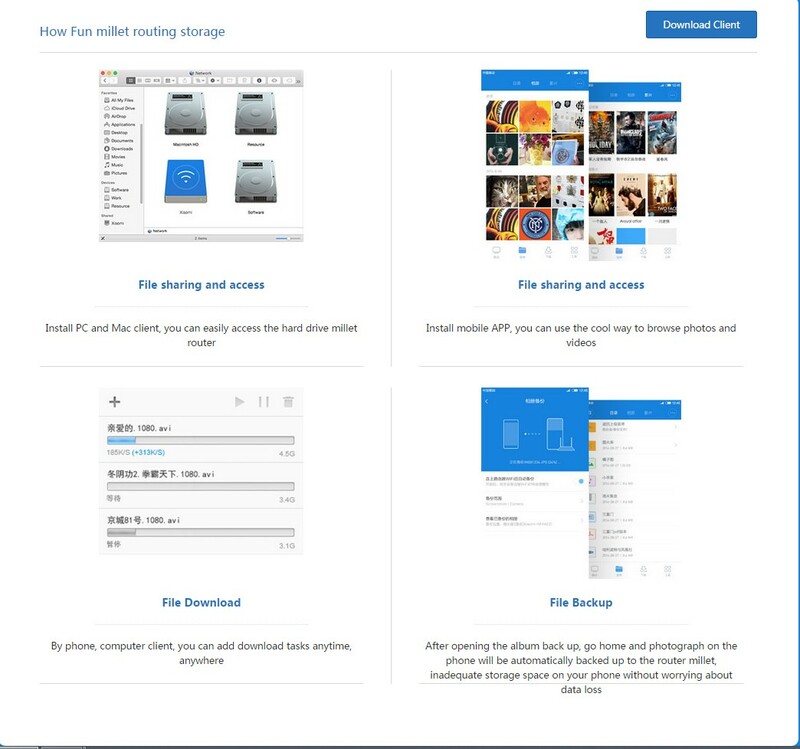 You can easily bypass government restriction in future by using the VPN. It supports L2TP and PPTP. 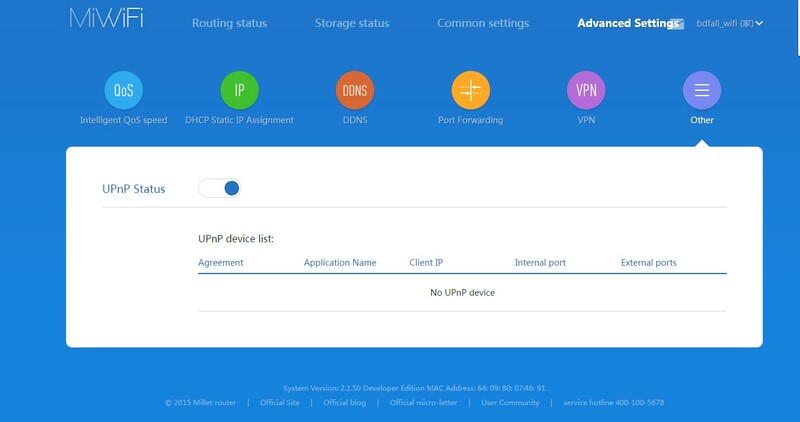 Other settings shows UPnP agreements by devices. The router uses a MediaTek MT7620A SOC which is supposed to be clocked at 580 MHz. But the router status shows an 800 MHz clock speed. Maybe the processor overclocked or it was just showing the wrong information. The router also packs a 128MB DDR2 RAM and 16 MB SPI flash memory. The 128MB RAM should be enough to handle the gargantuan amount of torrent connections created to download your favorite contents. To measure the router’s performance, I did ping and speed test at 4 different straight line distance from the router. At 15ft there was a single wall and at 30 there was a two wall barrier. At 40 ft there was a three wall barrier when connected a Xiaomi Redmi Note 4G version. According to its official specification, it has 80.211 a/b/g/n/ac Wi-Fi receiver and supports both 2.4 GHz & 5 GHz bands. The destination address was a BDIX connected IP which has an average ping of 5ms over Ethernet. Maximum transfer speed to destination IP was about 50 mbps. The router provided typical performance at 0ft. At 15ft the performance degradation was negligible. At 30ft signal became quite unstable and the transfer speed came down to as low as 19.25 Mbps while the average ping to destination increased to 19ms. At 40ft I got only 1 bar of signal. Ping time increased to 44ms. At 0ft distance, I was able pull 64.57 Mbps download and 57.52 Mbps upload. After 15ft the transfer speed pattern was same as 2.4 GHz. Only difference is ping. Which skyrocketed to whopping 77ms at gateway. The signal got rocky too. Typical Wi-Fi routers have a nasty habit of hanging, restarting under load. This load can be from utorrent, high transfer speed or too many concurrent clients. Also there are some culprit handheld devices which used to make problems. Like the iPad Air. Recently an Xperia T of my cousin started to create problem. Every morning, I have to restart my TP-Link because it crashed over the night. Xiaomi router on the other hand, didn’t hang or crash once in the last 2 months. It provided rock-solid performance. My parents were happy because they could easily watch YouTube videos, browse Facebook and use viber/skype with my sister in abroad. 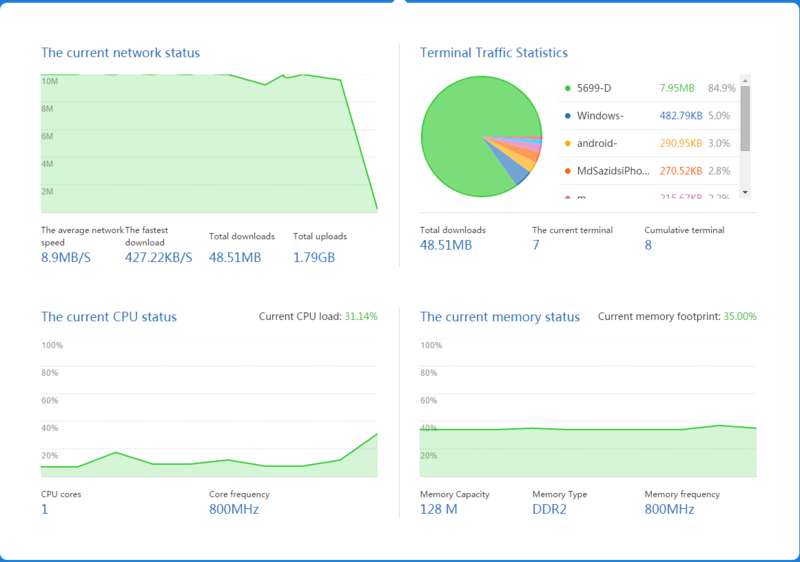 Conclusion: Xiaomi Mi router Mini is obviously a bang for the bucks in terms of performance. 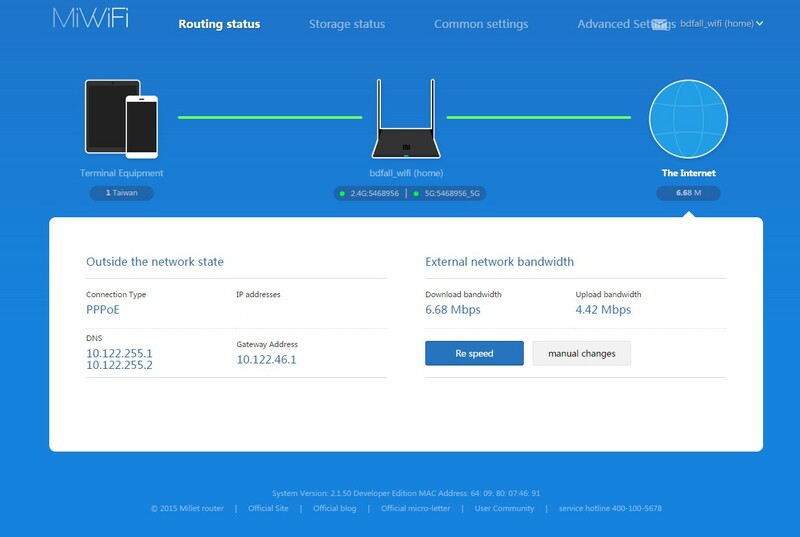 Despite being AC1200 router, the LAN & WAN ports are 100Mbps which can be downside for some enthusiast who are connected to a gigabit backbone. Another downside is that it has only 2 LAN ports. For some people, this can be a bummer. Also, Xiaomi doesn’t include any Ethernet cable. The previous firmware was a total disgrace. When I first booted the router, I faced so many difficulties that I was compelled to stop. The Chinese manual didn’t help me at all. Most of the routers use 192.168.0.1 as the IP for control panel. Surprisingly, this router uses 192.168.31.1 as the LAN IP which I had to find by decoding the user manual written in Chinese. The original review which was based on the 0.7x firmware was not favorable. The setup phase was less user-friendly and the settings were confusing. The update UI with the new firmware looks sleek. The setup phase is user-friendly. You can easily set it up by using some common sense. The device performed quiet then any of the device I used in this price range. I know the updated UI even though much more user friendly because of the language but good news is you can install any other DWRT or OpernWRT ROM in it. It works fine still. (For analysis on that wait for another review! ). This is the best bargain you can get at this price range and Xiaomi has done quite well for that. If you know what you are doing and want a superfast and efficient Wi-Fi then this device is for you! You can get the device in Bangladesh via GadgetGang7! Where is the review for installing OpenWRT? This one was very helpful. Enjoyed reading your review on the Xiaomi Mini Router. Perhaps, you should do a comparison in signal range between this router and others within similar category. I would love to do that. But it totally depends on vendors providing me the routers to do a comparison review.